With the HTC ThunderBolt being out for a few weeks now, it seems that it will be getting some company soon from the Samsung Droid Charge, HTC Droid Incredible 2, LG Revolution, and Motorola DROID X 2. 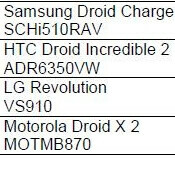 The Samsung Droid Charge (SCH-i510) is the official name of the "un-named Samsung 4G smartphone" we first saw at CES earlier this year. The device is expected to carry a minimum advertised price of $299.99 (making it $50 more than the HTC ThunderBolt), and will feature a 4.3" Super AMOLED Plus display, 1GHz Hummingbird single-core processor, an 8MP autofocus rear camera with 1080p video recording and a 1.3MP front camera for video chat, HDMI output, Wi-Fi 802.11b/g/n, Bluetooth v3.0, 828MB of internal storage, 1600mAh battery, and microSDHC memory card slot. The Samsung Droid Charge will run Android 2.2 Froyo and have a new version of Samsung's TouchWiz interface. The HTC Droid Incredible 2 (ADR6350) is a going to be a world phone with CDMA & GSM global roaming capabilities, but will lack 4G LTE. Pricing is shown at $199.99 and the phone will come with Android 2.2 Froyo, 1GHz Snapdragon processor, 4" WVGA TFT display, an 8MP rear camera and a 1.3MP front camera, 720p video recording, DLNA connectivity, and will come with a 16GB microSDHC memory card pre-installed. For $249.99 you can get the LG Revolution (VS910), which will also be a 4G LTE smartphone. We enjoyed using the device at CES in January, and even more a few months later at CTIA, as it will be one of the first Android smartphones on Verizon to support Netflix streaming. Features included Android 2.2 Froyo with LG's Optimus 2.0 user interface, 4.3" WVGA TFT display, 1GHz processor, 5MP rear camera and a 1.3MP front camera, HDMI port, DLNA streaming, Bluetooth 3.0, and microSD memory card slot. Lastly, the Motorola DROID X 2 (MB870) will be priced at $199.99, and will take the place of the current DROID X on Verizon's lineup. Even though the DROID X 2 will not have 4G LTE capabilities, it will come with a higher resolution 4.3" qHD display (540x960) and next generation processor, which some say will be dual-core 1GHz, while others say it is single-core 1.2GHz. It is also expected to come with Android 2.3 Gingerbread. But the camera will remain unchanged at 8MP. 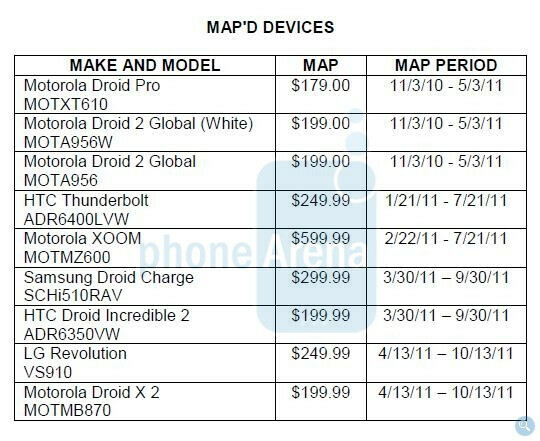 Keep in mind that the dates listed in the MAP are not the release dates, just the dates that the prices are in effect. Apple needs to make a LTE iPHone now for 199 so others stop overcharging for LTE. THere's minimal differences between the Fascinate and the charge. If you're gonna charge 300 bucks at least make it a dual core processor. really, what world are you living in? Since when would Apple help bring down prices? If they put out a 4G anytime soon it's going to be closer to $400 than $200. You must not have looked at smart phone prices pre-iPhone, and even post iPhone. I remember when Verizon sold the Treo 700W for 400 bucks on a 2 year contracts. Apple is really good at pricing themselves in the upper range of buyer budget constraints. I don't see the point of selling four nearly identical phones at the $250-300 price point. If I were Verizon, I'd start the Revolution at $200, the Bolt and Charge at $250, and the Bionic at $300. Then in a few months, across the board $50 price drop. Come on $299 for a Samsung Charge. Get Real Samsung! Remember the Galaxy S Tab came out at $599 also and is now $199 six months later. When Samsung updates the phones they put out vice keeping them on Android 2.1 and earlier is when I will even begin to look at them and at $299, I don't think so. Spot on. It would be nice if Verizon would make LTE offerings with different size screens, 4 or 3.7 inches to start. The holdup may be on the manufacturers end, who knows. Then get a small tablet. This steady stream of giant phones baffles me. What happened to the days when a cel phone was something you could slip in your jeans pocket? I'm the same way; after I switched to the Droid X, I wonder how I ever made it with a 3.2 inch screen. But 4.3 inches is cumbersome for a lot of people who have smaller hands, and Verizon is practically shunning a market segment by not offering LTE phones that are a bit smaller. it isn't the manufacturers' faults. it's Verizon and the idiot in charge of approving what phones they hold available. HTC has the Evo, Evo Shift, and now the Evo 3D on the way. they also have the WP7 Pro out so the diversity is there. same with LG and their Optimus 2x and Optimus 3D lines. Motorola with the Atrix 4G, etc... how Verizon only has a 1ghz single core processor with a 4.3 " screeen for each manufacturer is beyond mind numbing. it's like they think LTE is a big selling point and no other companies are doing 4G yet. on top of that, they're still releasing phone with no 4G. (DINC2 and DX2). i mean what's the point? It's as if Verizon said "we need an LTE phone the size of the EVO" and then accepted every manufacturer's proposal. There must be something about the LTE radio and antenna (or combination of CDMA with LTE) that forces them all into a similar large body. I think a company like LG would have been better off making a compact, affordable LTE phone like the Optimus/Vortex. The Revolution will just get lost in the shuffle. I was wondering the same thing earlier; are all of the LTE phones this large because the manufacturers are not yet able to cram all of the radios and antennas into a smaller package? It does seem sort of awkward. Well, it would explain why phones like the Incredible 2, Droid 3, X2 and (gasp) iPhone 5 will not be LTE. People here treat it like a bad marketing decision when in fact the technology might just not be capable of fitting into a slim device yet. KEYBOARD please. I agree. I want to ditch my Blackberry for a LTE phone but want to go to a keyboard phone. I'm disappointed--and somewhat surprised--that the Droid X2 won't come with LTE capability. At the least, it would be nice if the X2 was a global roaming phone like the Incredible 2. Verizon would sell a ton of X2's with either capability. Let's hope the X2 is at least dual core! I like that Verizon is quickly diversifying their offerings for LTE phones; they may be more or less be roughly the same, but at least consumers have a few subtle differences to choose from, primarily manufacturer. I can't see too many customers buying the Samsung Charge though; not while the Thunderbolt is priced for less.